The Damon Knight Memorial Grand Master Award is a lifetime honor presented annually by the Science Fiction and Fantasy Writers of America to no more than one living writer of fantasy or science fiction. It was inaugurated in 1975 when Robert Heinlein was made the first SFWA Grand Master and was renamed in 2002 after the Association's founder Damon Knight, who had died that year. The presentation is made at the annual SFWA Nebula Awards banquet, commonly during May, but it is not one of the Nebulas—which recognize the preceding calendar year's best works of SF and fantasy, selected by vote of all Association members. SFWA officers and past presidents alone submit Grand Master nominations and the final selection must be approved by a majority of that group. The recipient is announced in advance. The award was originally limited to six per decade and twelve were presented in the twenty years to 1994. From 1995 it has been conferred annually except in 2002. Also from 1995, SFWA has annually named as many as one Author Emeritus, "as a way to recognize and appreciate senior writers in the genres of science fiction and fantasy who have made significant contributions to our field but who are no longer active or whose excellent work may no longer be as widely known as it once was." The Author Emeritus is invited to speak at the annual Nebula Awards banquet. Fourteen were created in 16 years to 2010, none of whom has subsequently been named Grand Master. Its status as a consolation prize is one matter of controversy. 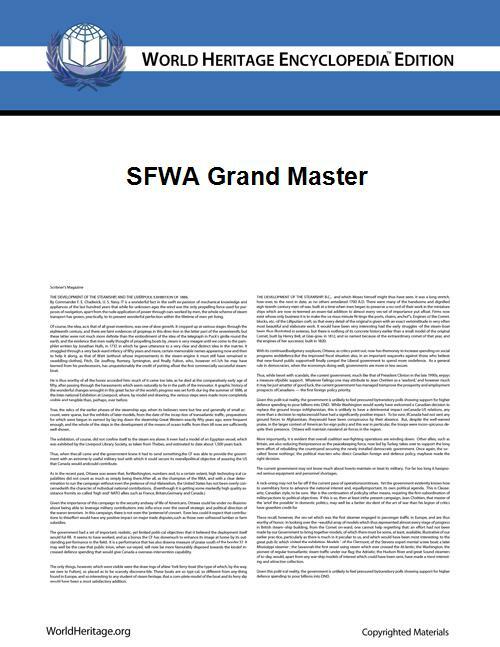 A total of 29 SFWA Grand Masters have been created in 38 years through 2012. The Gandalf Grand Master Award for life achievement in fantasy writing was awarded annually by the World Science Fiction Society from 1974 to 1981.